This is Hantei, a famed restaurant in Nezu, a shitamachi (low town) neighborhood near Ueno. 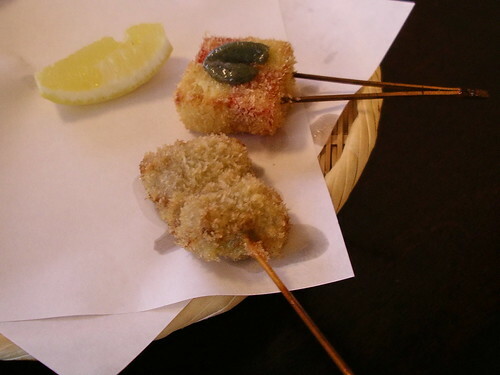 It serves kushi-age (deep-fried skewered food) but is known as much for the building it is housed in as for its food. 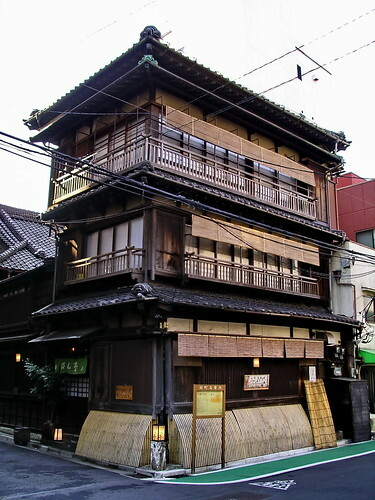 The original building is a three-story wooden structure built around a kura (mud-walled storehouse), with the restaurant now extended across the block through adjoining buildings. The exterior was built in 1909 (the kura is older, but by how much I don't know) and has survived the Great Kanto Earthquake, the devastating WWII fire bombings of Tokyo, and the purge of old buildings that occurred during Japan's economic bubble era. Old buildings are rare enough in Tokyo, but buildings that have seen the Meiji, Taisho, Showa, and Heisei periods and are still in fine shape are something to be celebrated. Seating inside the kura is reserved for groups, but the rest of the place has plenty of old-fashioned charm. 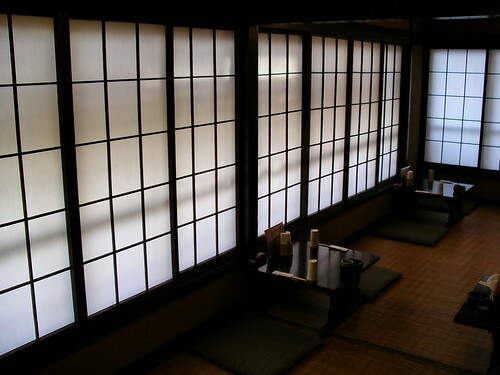 Especially the second floor, all tatami mats and low tables and paper shoji screens that block the views of electric wires and let in a soft, muted light. Perfect for retaining that traditional Japanese atmosphere, but no so great for taking pictures-- apologies for the fuzzy photos that follow. 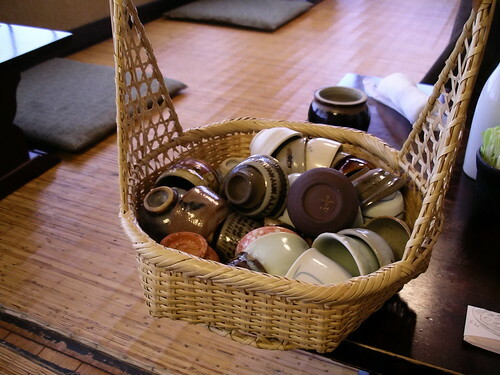 When ordering sake you are brought a basket of tiny sake cups, each one different, and allowed to choose which one you'd like to drink from. A tough choice as they are all beautiful. The standard course starts off with a few bites of karei (flounder) sashimi with a soft mentaiko (spicy cod roe) coating, and a garnish of soy-simmered nanohana (rapini). 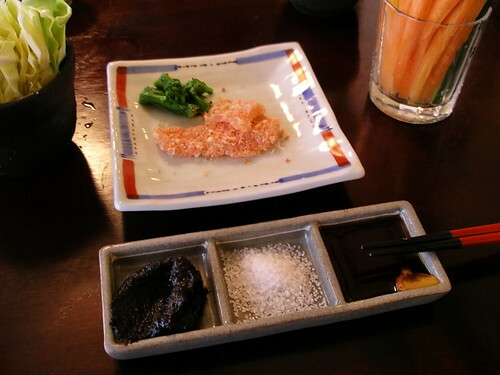 At this time the accompaniments to the kushi-age are brought: vegetable sticks (carrot, cucumber and daikon), fresh cabbage, and three dips: akamiso (red miso), salt and sosu (a Worcestershire-like sauce) with mustard. The akamiso is mostly for the vegetables and the latter two are for the kushi-age. 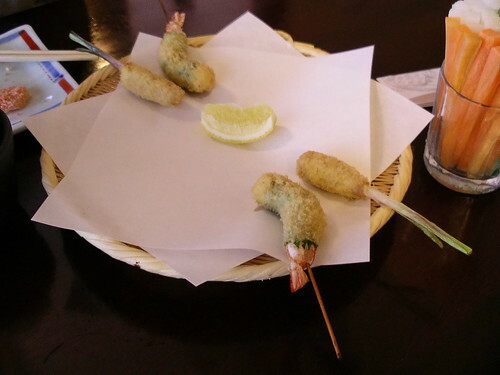 A lemon wedge is usually served along with the kushi-age as well. The first two skewers arrive: shrimp wrapped in a shiso (perilla) leaf, and hajikami (ginger shoot) wrapped with thinly sliced pork. 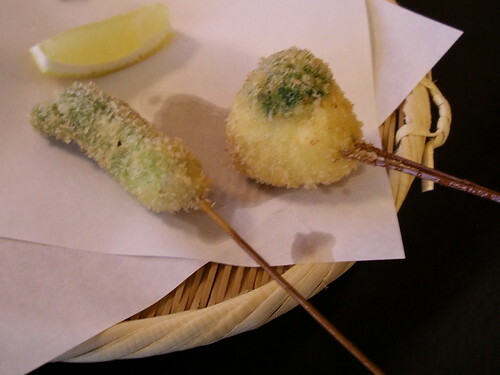 As with all kushi-age, they've been dipped in a batter, then panko breadcrumbs, and deep-fried until crisp. They are fried with such skill that they don't taste greasy at all (although the splotches left on the serving paper is evidence that they were fairly oily). Next up was taranome (the young shoot of the taranoki tree) and nanohana wrapped with hirame (sole). These were followed by a lovely dish of crab-stuffed ganmodoki (deep-fried tofu) simmered in dashi stock and garnished with yuzu citrus, but I ate it up before I remembered to take a picture. The next two were beef and gobou (burdock root), and squares of kyoninjin (a red type of carrot from Kyoto) and yuba (soy mild skin) topped with yomogi (mugwart) sauce. 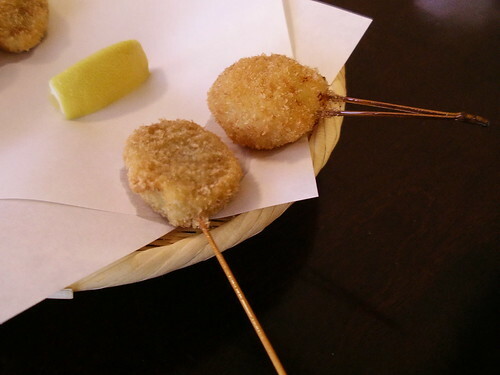 The last two skewers were renkon no karashi niku-tsume (lotus root stuffed with a mixture of pork and mustard) and and a large plump hotate (scallop). When the skewers were finished the shokuji (literally meal, it's the rice, pickles and soup that signal the end of the meal) was brought. 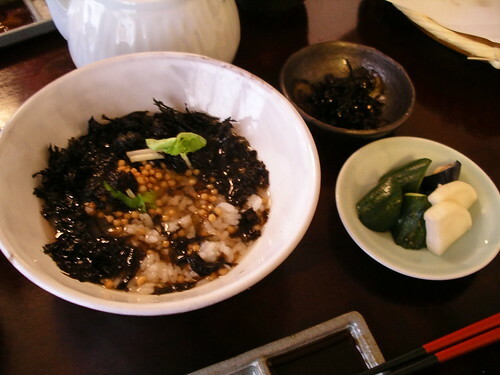 I opted for ochazuke (rice with hot tea) and it came topped with iwanori seaweed, with kombu no tsukudani (kelp braised in soy sauce) and asasuke (salt-pickled cucumbers, eggplant and kabu turnip) on the side. The meal was finished with a tiny scoop of ume (Japanese apricot) sherbet. Wow, everything you do and everything you eat is just. so. beautiful. What a wonderful place...and the food looks great...I just love the building.!! What a beautiful building - it must be quite an experience to eat in there. And the food! deep fried everything? I'm there! I love shoppign in Ueno, my husband always finds great hoodies, sneakers, hats, etc. What a charming resturant! I hoep to go there someday on my shopping excursion! What a beautiful house and delicious bites! Would have loved to been there! As a result my wife and I had a really nice Saturday wandering around, from Nishi-Nippori to Nezu, finishing at Hantei for dinner. Thank you for the comments! And Tokyomb, I'm glad you liked it.